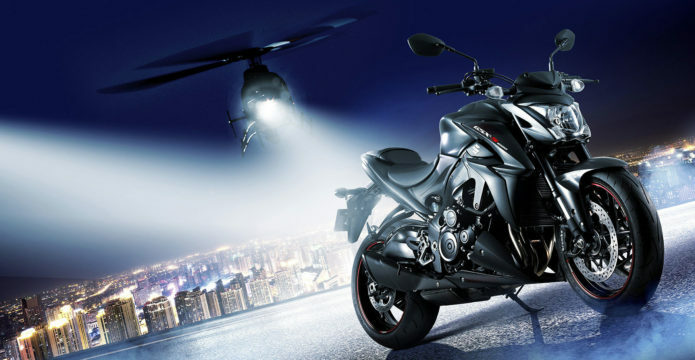 With the 2018 model, Suzuki’s addressed a couple of those complaints. A refining of the bike’s EFI mapping is supposed to result in smoother throttle operation, and it does. Those who complained about the old model’s snatchy response (Evans Brasfield, et al) like it much better now, though there still may be concerns re: steady-state fuelling midcorner. For me, she’s fine, since my spastic sport mode means I’m usually either slamming on the brakes or whacking the throttle open. For whacking, the GSX retains its four-way (including off) traction control. For braking, we’ve now got ABS (even if it’s not the latest cornering-sensitive type). Nobody complained about the brakes, but we get beautiful and powerful new Brembocalipers like the ones on the latest GSX-R, squeezing 310mm discs, and fed by uprated hoses. I tested these on Socal’s 57 freeway, coming home in the evening after a day in the mountains. Checking my 8 o’clock as I attempted to move into a lefter lane where the 57 meets the 60, I checked it again a half-second too long to see if a truck was moving over into the spot I wanted from the other side… it was. And when I looked back ahead the car in front of me was almost stopped. Dang, I am going to run into the back of that car; this won’t be pretty. My brain had given up but my braking fingers had not – eek eek eek the Suzukistopped crazy hard but true, 3mm from the new Civic’s bumper. Everybody went on about their business. ABS is worth every penny.